Crashing Wave pictures for painting. Love these digital cameras, took some movies too on the same camera, AVI's wanted to save some of the action there. Yes I still crawl all over the rocks, hubby stays pretty close to me I am not real steady on my feet under those conditions but I love it the intense feelings about the energy, the power , the beauty of the place, there is nothing else like it. Thanks for sharing these magnificent photos! 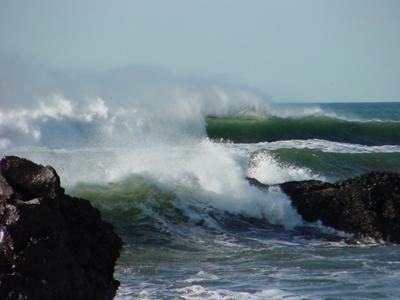 I can almost feel the sea spray!!! 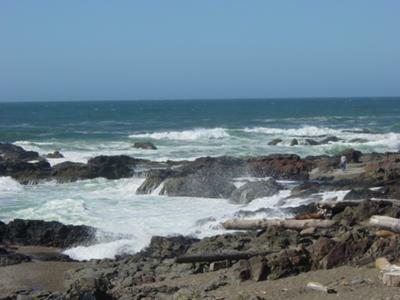 I want to see Yachats! 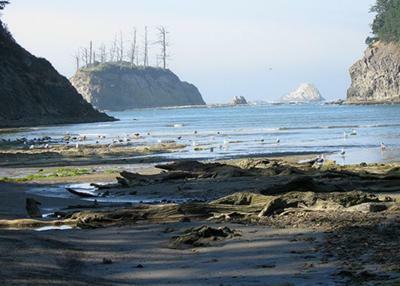 I live near Patrick's Point and Trinidad in Humboldt County and the scenery is a lot like your pictures. It is breathtaking!! I moved here after living a lifetime near Detroit so I am so thankful to have found such a beautiful treasure. Love these pics and beautiful. Thanks for sharing them with all of us. Join in and write your own page! It's easy to do. How? 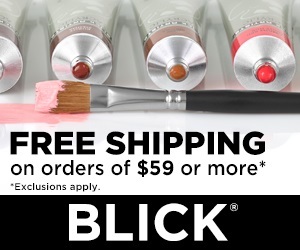 Simply click here to return to Your Reference Photo's!. 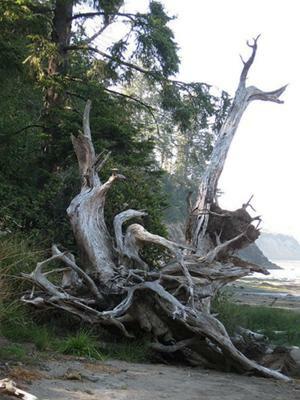 Shore Acres is a State Park in Coos County south western Oregon coast. A rugged coast line with cliffs over 80 feet tall, a nice parl for parking and beautiful flower gardens. People come from all over the nation to see it every spring when the gardens are in bloom, there are paved pathways along the cliff with benches for resting and viewing. 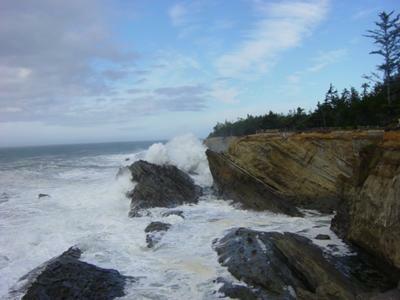 On a windy stormy day the breakers against the cliffs have been known to splash over two hundred feet high. Its a beautiful park among several along the coast. 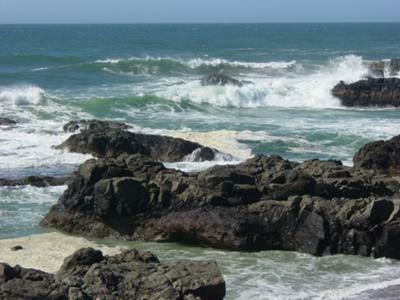 Its wonderful to see nature in its natural state, feeling it, tasting it, hearing it and even whale watching in its season. 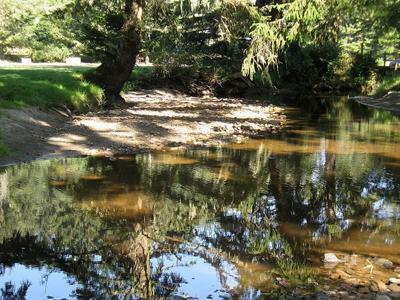 We come here often, its restful and fills you with an inner peace. 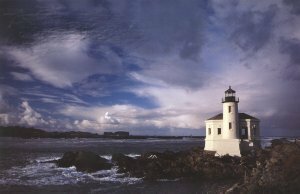 Coos County has five beautiful parks, with the sea, the hills, the forests, and the rivers, its an artists paradise. 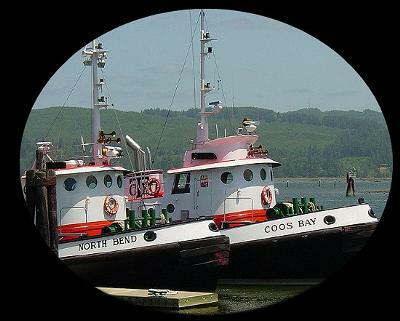 The tug boats are local here at Coos Bay-North Bend (small sister cities). They are photographed a lot. 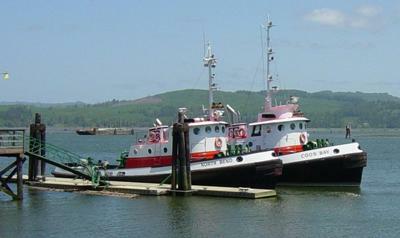 They are the tugs that guide in the many ships that come into out port, and are favorite painting subjects for many of the local artists. Sunset Beach A State Park is beautiful and interesting even when the tide is out. 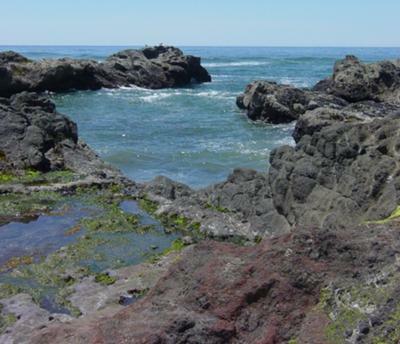 there are tide pools and interesting cliff formations and walking paths everywhere. We walked along the path beside the stream leading to the entrance from the sea. 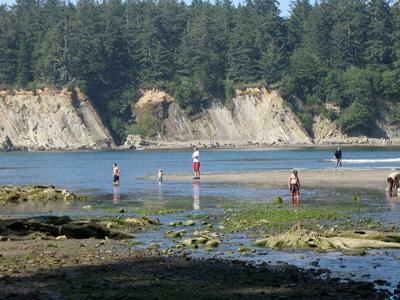 People playing in the water (low tide) often playing in their kayak's or row boats. Many people are taking pictures, we see cars from many states and out of the country here at this time of year and in the Spring... They come to see out parks and the sea.